Hi, my name is Leida and I’m a chocoholic. Author Judith Viorst once said, “Strength is the capacity to break a Hershey bar into four pieces with your bare hands - and then eat just one of the pieces.” I applaud anyone that has the self-control to stop with just one piece. For me, that is not even remotely a possibility. When it comes to chocolate, I just can’t help myself! I’m not saying I’d steal candy from a baby but, well, if the baby wasn’t looking… There is nothing quite as exquisite as biting into a rich, decadent piece of chocolatey goodness. Unsurprisingly, Valentine’s Day is one of my favorite holidays. This was a particularly magnificent one, thanks to my husband’s present: a box of chocolates made out of chocolate! Can you imagine my reaction to opening the present? First, I was so ecstatic I was speechless. Then, I was on cloud nine as I began to sample some of the extraordinary Belgian chocolates. Lastly, I was in awe of the incredible skill it must have taken to craft. If you’ve ever tried to make chocolate candies yourself, then you know how temperamental chocolate can be. Often you’ll hear people say that there is an art to creating these tasty confections, but did you know that it is actually a science too? The key to perfect chocolate candies involves a process known as tempering and proper tempering is what sets apart divine chocolates from the (still pretty delicious) mediocre ones. Tempering is just the process of heating then cooling a substance in a controlled manner to improve its quality. You may be familiar with tempered glass, in which the tempering serves to strengthen the glass so that shatters into small chunks rather than jagged pieces. In the case of chocolate confectionery, this means achieving that irresistible silky gloss and the right amount of snap to satisfy the taster. The best thing about tempered chocolate is that heavenly “melts in your mouth” quality. So, why must chocolate be tempered? When making candies, couverture chocolate is often required. This is a higher quality chocolate product that has more cocoa butter, a type of vegetable fat, than normal varieties of chocolate. This higher proportion of cocoa butter is what makes tempering necessary. The problem with cocoa butter is that it can exist in many different crystal forms not unlike another material you hear about often: carbon (think diamonds and graphite, both equally excellent gifts). Similarly, the various types of cocoa butter crystals, six in all (referred to as Types I-VI), have different properties. This lack of uniformity leads to poorly behaved chocolate. 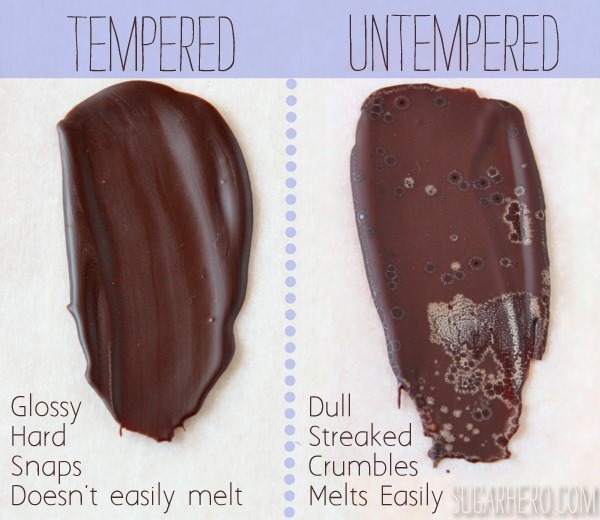 Improperly tempered chocolate is actually quite easy to spot (see figure below). Ever noticed chocolate that has a grayish, streaky or spotty appearance? If the answer is yes, then you’ve encountered poorly tempered chocolate. The goal of tempering is to heat up the chocolate to melt all the crystals and then cool it such that only the desired crystals can reform. Types I-IV are the unstable crystals and undesired, since they all melt easily at room temperature or below and won’t form rigid structures, making the chocolate soft. Type VI crystals can’t form at the temperatures at which chocolate is worked, so essentially good quality chocolate requires Type V crystals. Think of Type V crystals as the diamonds of the chocolate world. When these crystals are formed they give the chocolate a nice shine, the proper firmness, and the all-important proper melting temperature of 37˚C: body temperature, which is why great chocolate melts in your mouth.